With Easter just around the corner, there's finally an excuse to bake delectable, chocolatey recipes and stuff your face with all the delicious vegan treats popping up in both specialty and mainstream stores. 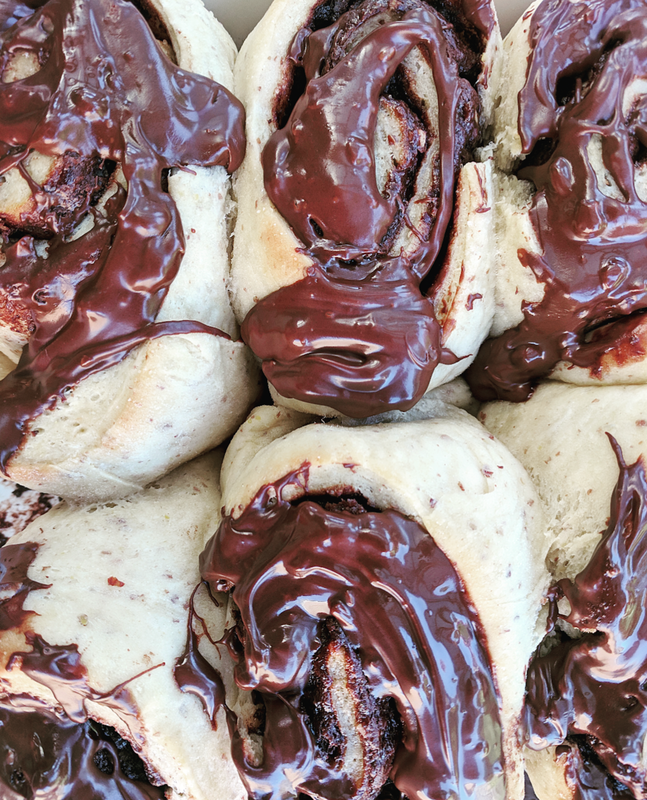 It's a great time to be vegan, and it's the perfect time to try out my Chocolate Hazelnut Rolls, which are soft, warm and made with the utterly indulgent Vego Spread. They are surprisingly easy to make and only require a few ingredients, but are guaranteed to have your vegan and non-vegan friends totally satisfied and wishing they wore looser pants. Grease a baking tray with vegan butter or oil and set aside. Combine milk, sugar and yeast in a medium sized jug and set aside for 10 minutes. In a handheld mixer or a stand mixer fitted with a dough hook, mix flour and salt for 15 seconds. Slowly add milk mixture, flaxseed mixture and butter until dough is smooth (about 5 minutes). Place dough in a clean, well oiled bowl, cover with tea towels and leave in a warm place for 1 hour. Once dough has risen, combine all filling ingredients in a bowl and microwave until smooth. Roll out dough into a large rectangle and evenly spread mixture over it. Starting from the long side, roll up dough until it forms a long, snake-like shape. Cut into pieces (8-12, depending on how big or small you'd like your rolls to be) and place each one in the prepared tray. Top each unbaked roll with butter and vanilla, and bake in your oven at approximately 190 degrees Celsius for approximately 25 minutes. Remove from the oven and drizzle over warmed up chocolate spread. Serve warm and within a day or two (fresh tastes best! ).